1. Blend together the corn, onion, tomatoes and 1/4 cup of the stock for 1 1/2 to 2 minutes. 2. Heat the remaining stock in a large pan and add the blended mixture. 4. Heat thoroughly but do not boil. 5. Add the whipping cream and reduce heat. 7. Garnish with strips of roasted capsicum and serve warm. Tip: You do not have blend the ingredients smooth. Small chunks of the vegetables are fine. 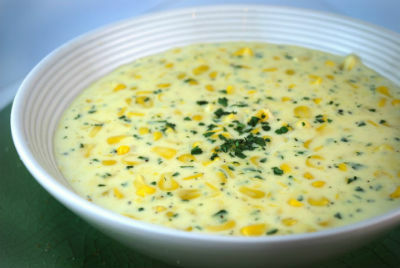 Feel free to comment or share your thoughts on this Creamy Corn Soup Recipe from Awesome Cuisine.